Well, I’ve got good news and I have bad news. Let’s get the bad out of the way. 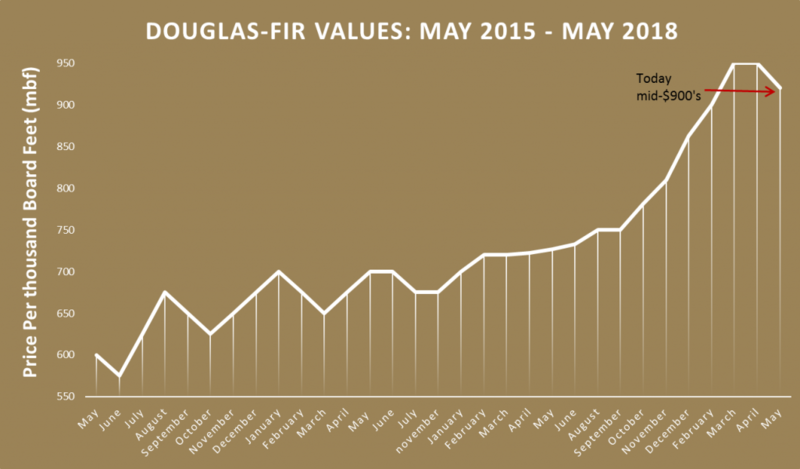 Doug-fir log values have finally started to level off and dip a bit since there high reign over the last year and a half. The good news is values are still in the mid-$900/MBF range. Log buyers are in the market, but their inventories are starting to fill up fast as we wait in anticipation to see what fire season will do. If fire season restricts log deliveries, the log market might take another climb. This is great news for log sellers if you’re operating in a less restricted area and can find a truck to get your logs to the mill or sort yard. If we have a mild fire season, we may continue to see log prices dip. An important point to remember: with all of the activity in the woods for the past couple years, seedling nurseries sell out fast and may already be sold-out of many of their species, so be sure to think about purchasing seedlings at the same time as thinking about doing a timber harvest. With lots of logging going-on, that means lots of loggers working…and truckers trucking…and sometimes folks finding it difficult to find a logger and/or trucker. I spoke recently to a self-loader operator and he told me they have been consistently over 100 loads behind in the last few months. So you might be in a hurry to get things going, but finding someone to do the work might slow things down. Moral of the story: plan ahead – 6 months to a year ahead. Chip prices were low for a while, due in large part to mill activity, but chipping material is finally starting to come around again. Conifer chips are above $40/ton. For small landowners chipping material rarely has much monetary incentive, but can be an option if you are doing a large stand improvement project. Today, with prices so good, it’s worth it to go for sawlogs. Don’t forget some fiber mills are actively looking for hardwood chips and they are $10-15/ton less than conifer chips. Speaking of hardwoods, alder, maple, and ash are actively being sought after by hardwood mills. At the time of this report alder is priced nicely at $700-$800 per thousand depending on log size. Whitewoods are also in demand. While their values are strong they are down a bit from last quarter. High quality 6-11” logs are averaging in the mid -$600’s. However, the larger diameter hemlock/spruce/grand fir is in less demand than the 6-11 inch logs and are running a little under $600. Both incense-cedar and western redcedar prices remain steady, but all in all at amazing prices. Incense is claiming $700 – $800 per thousand board feet. Sort yards here in the Valley are paying around $1300/MBF for western redcedar long logs. While Ponderosa pine isn’t known for bringing in the big bucks it is holding strong around $550. Remember there are now two pine buyers in Lane County and you don’t have to truck pine to Roseburg or Medford to sell it anymore. Logs aren’t the only thing from your woods you may be interested in selling. There are some non-timber forest product buyers around and they have a few products that they are looking for. Usnea lichen is claiming $5.50/lb, but make sure you know how to identify it because there are some look –a-likes out there. It helps to bring in a small sample first to make sure everyone is on the same page. Cascara bark is now in high demand and runs $1.20/lb dry and 45 cents/lb green. Sitka spruce cones are also in high demand. Did you know they are put into potpourri mixes? If you have a forest service collection permit, ‘tis the season for Pipsissewa, or commonly called prince’s pine, devils club bark, and bearberry. Prices and trends for this summer are maintaining so far, but may be lower by the time you read this article. Only time will tell how long the big bucks will last. As I look into my no-so-crystal ball, I expect prices will stay strong for at least the immediate future, but the market will have to reset at some point. Now that we’ve had some dry days this spring some of our dirt logging crowd may have started up again. This will make loggers and truckers even busier. Considering a harvest? I hope you’ve lined up your operator and trucker already, we cannot guarantee how long their availability and these prices will last. Good luck and always remember to get your purchase order before you cut! ~ by grandl on June 8, 2018 .